There are a good amount of new coupons to add to your ever-expanding collection. There are some good ones here – especially when doubling is taken into account. 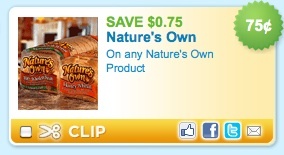 The best one to grab right now is a new .75/1 Nature’s Own Bread coupon. These are B1G1 at Publix this week, so it makes a loaf of bread 59¢!!! Use zip code 90210 if you can’t find it.